We would like to remind the readers of the present volume that it was, like its predecessor (The Life of Ramakrishna), primarily written for the Western readers, and that the views and interpretations given in it are not all of them necessarily those of the Ramakrishna Order. 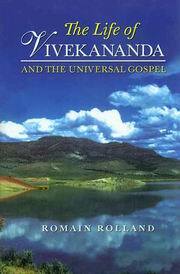 We should also mention that we have omitted a few footnotes as unnecessary, and also a chapter ('The Awakening of India after Vivekananda') which was written specially for the Western readers, and have added a few footnotes of our own-all at the wish and with the approval of M. Romain Rolland. Rolland was born in Clamecy, Nièvre to a family of notaries; he had both peasants and wealthy townspeople in his lineage. Writing introspectively in his Voyage intérieur (1942), he sees himself as a representative of an "antique species". He would cast these ancestors in Colas Breugnon (1919).